Arab woman detonates car bomb near Ma'ale Adumim, lightly wounding one police officer; bomb meant for Jerusalem. Israel Police reported early Sunday morning of an explosion heard on the main road to Ma'ale Adumim, a few miles east of Jerusalem. Police officers from the Ma'ale Adumim precinct noticed a suspicious vehicle being driven by a female Arab driver and signaled for her to stop the car for an inspection about a half mile ahead of the al-Zaim checkpoint. The driver, a 31-year-old resident of eastern Jerusalem, approached the police officers and shouted "Allahu Akbar," seconds before detonating a bomb. Contrary to earlier reports, the Israel Police has announced the terrorist is not dead, but seriously injured with burns over her entire body. She is currently receiving medical treatment at Hadassah Medical Center in Jerusalem and is on a respirator. 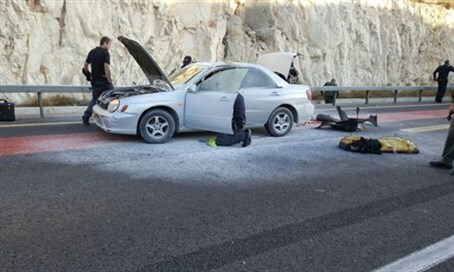 Testing of the car revealed several other explosives which the terrorist apparently intended to detonate in an urban center in Jerusalem. A policeman, 45, was lightly injured with burns to the upper body in the explosion and has been transferred for medical treatment at Shaare Zedek Medical Center in the capital. The site of the blast, which is along Route 1, was blocked to traffic pending the conclusion of the investigation on scene. The road has since reopened. Gas balloons have been found in the car, Ma'ale Adumim police chief Rafi Cohen stated later Sunday morning, and checks are underway to determine whether the car was stolen. Davidi Asraf, the spokesperson for the Jerusalem Police District, added that the terrorist had planned to detonate the bomb in Jerusalem, based on details of the investigation still under embargo.